Sometimes it's what we need. So often I find myself bored with simple knitting, but right now it's the perfect stress reliever after a busy year. It's a great way to relax at the end of a day spent trying to get things in order for graduation, grad school, and (most importantly) my trip to Bali. I'm not one to say this very often, but right now garter stitch is indeed my friend. I am making slow progress on my brother's blanket, but slow and steady wins the race. I'm almost done with that sixth square, which leaves about, well, we won't talk about how much is left. Those are pretty sizable pieces of knitting, too. The white squares alone are a foot wide. I also seem to be making progress on the sock that I mentioned in my last post. In fact, I've knit an entire foot! I'm knitting a plain stockinette sock (with hopes to make a pair one day) using STR Mediumweight in the "Terra Firma" colorway, gifted to me by the unbelievably generous and wonderful Joan. After swatching several times, and knitting a couple different toes and never having things come out right, I decided to just "wing it", and so far it's working. I've knit the heel a couple times now and I think I may rip it out again. When I try on the sock, that annoying voice keeps saying, "You know, I think this sock could be just a little longer..." and while ignoring that voice would allow me to finish the sock faster, I think coming out with a wearable pair might make a bit more sense. Also, can I just say that I love how nicely the colors are playing together? My first rendition of this sock was just... less harmonious. These simple projects are a great accompaniment to my latest endeavor, which is to learn a bit of Indonesian before my trip. At my public library I found a set of CDs to learn from, and so far things have been going pretty well. "Sekarang saya bisa bicara bahasa Inggris dan bahasa Indonesian sedikit." See? Not bad, right? I'm only halfway through the lessons, so hopefully progress will continue. Of course, I can just see my friend laughing right now (you know who you are) because he thinks my Indonesian is too proper and he always calls me a "bule lucu" (silly American, though it's a bit more derogatory than that). I just like to think that I'll be prepared to meet the President. Remember those dandelions I showed you a couple posts ago? Well, it would seem my friend caught my in action while I was taking their pictures. It's interesting looking at this picture and then seeing the final results. Well, I have to run to a meeting with my professor now (and then I'm DONE!) and then I have a gamelan lesson, so I will have to bid you all farewell now. Oh! Speaking of gamelan, we had a performance a couple of weeks ago. That's me in the front with the sunglasses. ...Yeah, I play a pretty mean suling. Wow, those cubes are going to look fantastic when you're finished. You've been busy! The performance shot is really cool-thanks for sharing that! I swear you just keep getting more adorable. I love that photo of you on the grass! Totally our Peter. I gotta say I agree with Cookie...that's a great/adorable picture of you in the grass. If it weren't for the facial hair, it might be really hard to even tell how old you are. Oh, and congratulations on having a nicely shaped head. As for the blocks-I'm so proud of you! Yay! Keep going! It's funny how the simplest knitting can seem to drag on forever in a longer project. Those blocks for your brothers blanket are cool I love the way they are coming out. I can't wait to hear all about your trip to Bali. Congratulations on graduation. I went to the Commencement concert last night, but you weren't playing. Make the sock longer and have a great time in Bali. Sometimes it is the simpler knitting that is the most rewarding. The blocks you're knitting are wonderful...love the colour choices! for the blocks and the socks. Great photograph of you with the dandelion photoshoot. 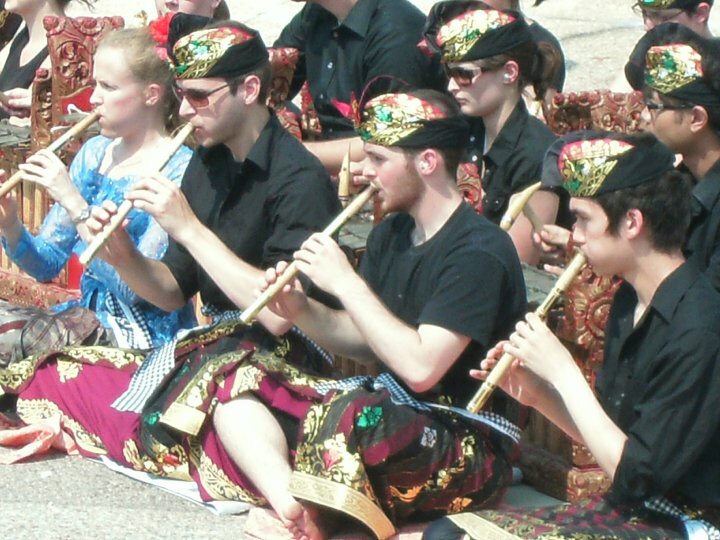 Is the attire you're wearing in the performance traditional for Bali?